A private tour on foot with a professional guide (only for You) of Sorrento center, the archaeological area and the Museum of Paestum. ENTRANCE FEES OF RUINS AND OF THE ARCHAEOLOGICAL AREA OF PAESTUM ARE NOT INCLUDED. The combined ticket of the archaeological area + the Museum costs Euros 6,50 per person. The National Museum of Paestum is closed on the 1st and 3rd Monday of each month. 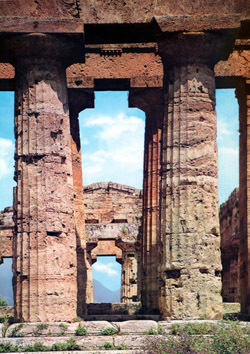 This trip is a nice combination of a scenic tour (to Sorrento) and an archaeological tour (Paestum). Sorrento is small town wonderfully located over white steep cliffs and offers a fantastic view over the Bay of Naples. It lies on a tufa terrace and is enclosed by impressive rocks of the limestone mountains. For 2000 years already visitors from all over the world have been attracted to Sorrento by breathtaking sunsets and fragrances of orange and lemon gardens. After the visit of Sorrento and the transfer to Paestum, you can have free time there for a snack: it is a great solution because there (and only there) you can try a buffalo mozzarella cheese. After that the guided tour of Peatum can start. 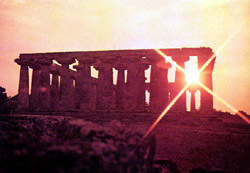 Paestum was founded by Greeks around 600 b.C. 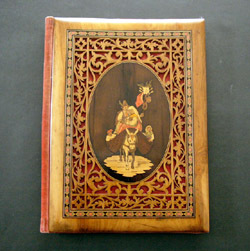 At the beginning it was called Poseidonia, since it was dedicated to Poseidon (the Roman Neptune), the god of the sea. In 400 B.C. it was occupied by the Lucans, an Italic populaton. The Lucans ruled it till 273 B.C., when it became a Roman colony and was called Paestum. The fall of the Roman Empire meant also the decline of Paestum. As matter of fact, around 500 B.C., since the mouths of the rivers running in the plain were silted up, the whole area became quite unhealthy. Malaria had already spread all over the place and even the built-up area became marshy. Consequently the population gradually left the town. In conclusion, such a disaster was caused by the deforestation of the nearby hills. Actually, these magnificent ruins were preserved by marshes and woods, which prevented them from being destroyed and ransacked for many centuries. Paestum was rediscovered just by chance in 1752, when they were building the modern road cutting the ancient town into two parts. 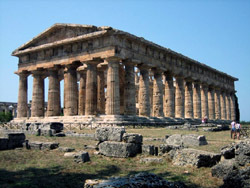 Of particular interest are the Greek temples of Paestum, and above all the Temple of Neptune. THIS PRIVATE TOUR IS NOT AVAILABLE ON THE FIRST AND THIRD MONDAY OF EVERY MONTH, CLOSING DAY OF THE NATIONAL ARCHAEOLOGICAL MUSEUM IN PAESTUM. THE TOTAL PRICE OF THIS PRIVATE TOUR IS OF EUROS 250.